We were excited to get our hands on a cool activity book called Born to be Wild: Hundreds of Free Nature Activities for Families by By Hattie Garlick. Born to be Wild is a stunning book which is written by a mother so she knows the challenges of the modern world and what we all face, especially when it comes to Ipads and game consoles, Born to be Wild provides a guide to help you get your family out if the home and outside to explore and have fun at a minimum cost. "The average British child watches over 17 hours of TV per week, a figure that has risen 12% since 2007, despite the rival attractions of the internet. Britain’s 11-15-year-olds are so addicted to their electronic devices that they spend 7½ hours a day in front of a screen – an increase of 40% in a decade and around half their waking lives. A generation ago, half of British children regularly played in wild places, now it is less than one in ten"
Born to be Wild has is filled with amazing activities which are easy to follow and great fun, from building a butterfly feeder to creating a woodlouse race. The book is organised into seasons so there will be plenty of activities to get you started no matter what season you intend to explore. Hattie suggests a simple toolkit which consists of everyday items you can find in your home. 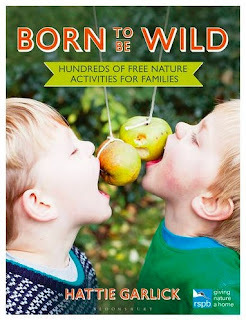 Born to be Wild: Hundreds of Free Nature Activities for Families is available in Paperback for £16.99 from all good bookstores.